BELLOWS FALLS, VERMONT - In 2012, Eugene Friesen, renowned cellist and multi Grammy Award- winner for his work with the Paul Winter Consort, first offered his Vermont Improv Intensive, Improvisation for Classical Musicians, a weekend, residential music workshop at Immanuel Episcopal Church in Bellows Falls. 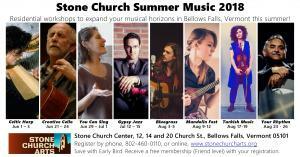 Since then, Stone Church Center has added the Retreat House at 14 Church St., Currier Hall at 12 Church St., and now offering a summer full of music in the village of Bellows Falls, Vermont. Eugene still offers his workshops at Stone Church Center, and now a variety of other musicians and music teachers present a diversity of programs for nearly every sort of musician interested in expanding their skills and repertoire. Concert-goers will also delight in the great diversity of world music on offer, from Eugene Friesen and friends’ cutting-edge world music and improvisation to Celtic harp, bluegrass, mandolin repertoire, drumming, singing, and Turkish music. Things will be heating up this summer with so many concerts both in the main church and in the air-conditioned chapel. featuring Eugene Friesen and special guest Jacob Szekely. Join us in Vermont this summer on our beautiful Stone Church Center campus for Stone Church Summer Music 2018. All the workshops begin on Thursday or Friday evening. Participants arrive after 4 pm and dinner is at 6 pm. Please consult our website, www.stonechurcharts.org, for details and pricing on each workshop. Concerts are on Fridays or Saturdays at 7:30 pm except for the Mandolin Ensemble on Sunday, August 12 at 3 pm. Tickets and workshop registrations are now available on our website, by calling 802-460-0110, or in person at Village Square Booksellers in Bellows Falls.